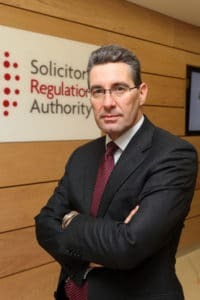 The uncertainty that has followed the vote for Britain’s exit from the European Union should not slow down reforms in the legal services market, Paul Philip, the Solicitors Regulation Authority’s (SRA) chief executive, has warned. Meanwhile, several areas of legal regulation could be affected by Brexit, according to an SRA report on the subject aimed at solicitors, while separately the Law Society has set out the work it is doing following the referendum vote. Exiting the European Union: An update for lawyers recognised that nobody knew what was going to happen at this stage, but said the report was “about managing risks associated with uncertainty”. Brexit has been cited by the Law Society as a reason for the SRA not to pursue its current reform agenda, which includes a radical simplification of the code of conduct, or for other reforms being considered by the government and the Legal Services Board. The SRA report highlighted several areas of particular concern that emphasised how embedded the EU has become in legal practice. These included the EU as a subject for law students; the primacy of EU law over member states’ laws; the role of England and Wales as a gateway for international law firms to the EU single market; and lawyers’ practising rights across the union. The SRA pointed out that European lawyers could practise in the UK and there were reciprocal rights for UK lawyers. Non-lawyers could also practise non-reserved areas of law without being subject to regulation across the EU. This would not change in the short term. In relation to education and training, the SRA said it had confirmed with providers that the status of EU law as a compulsory subject for law students would not change in the coming academic year. The SRA set out a checklist that “law firms may wish to consider over the coming months and years” under the headings ‘entering the market’, ‘people’, ‘clients’, and ‘planning ahead’. Mr Philip added: “It is, of course, too early to draw any firm conclusions about the implications on the legal sector of a British exit from the EU. We have been clear that there are no immediate regulatory changes. Meanwhile, in her report to tomorrow’s Law Society council meeting, chief executive Catherine Dixon revealed that she has met with both Richard Heaton, permanent secretary at the Ministry of Justice, and Jonathan Jones, head of the Government Legal Service, “to discuss our initial assessment of the legal implications of Brexit and represent the views of our members with a particular focus on protecting the legal sector as a supporter and enhancer of business”. She continued: “I also offered the government the expertise we have within the Law Society boards, committees and staff in an advisory capacity should the government need it. This was well received and further engagement with government stakeholders will follow. “I also met with the Deputy Mayor for Business at the Greater London Authority (GLA), Rajesh Agrawal, and Gareth Bacon AM and Andrew Dismore AM. Given the potential effect of Brexit on London, it was useful to discuss the immediate priorities of the Mayor of London and the GLA. We will continue to work with them as this issue progresses. “The president and I will be meeting with the Home Secretary and the Security Minister in September to discuss Brexit, legal professional privilege and other areas of importance to the legal profession. The society has set up a Brexit task force, jointly chaired by David Greene of Edwin Coe and Stephen Kon of King & Wood Mallesons. Its first meeting is on Friday. “We have also created a manifesto on Brexit which we will use at the forthcoming party conferences,” Ms Dixon added.